Now that you know what kinesiology tape is and the different types that are available, the logical next step is to educate you about how it is used. Kinesiology taping takes a completely different approach to athletic taping than the rigid, immobilizing sports tapes most athletes are familiar with. This approach evolved from the desire of many athletes to continue to train and compete as they recovered from their injuries. 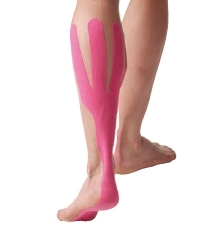 While rigid taping techniques make this difficult because of the immobilization of the injured areas, the elasticity of kinesiology tape allows an effective taping to be accomplished without restricting a normal range of motion. This reduces the need to compensate with uninvolved muscle groups, which can negatively effect both function and performance. First introduced by the makers of Kinesio Tex Tape as the Kinesio Taping Method, the technique involves applying tape directly over an injured area, as well as around its perimeter. In most cases, the muscles should be held in a stretched position while the tape is applied. Unless the goal is to provide structural support, the tape itself does not usually require additional stretching as it is applied. The natural elasticity of the tape creates a microscopic lifting action of the skin, which activates both neurological and circulatory healing mechanisms. Reduced pressure on pain receptors can rapidly relieve acute pain, while improved blood flow and lymphatic drainage reduce swelling and facilitate healing. Provide structural support to joints and muscles without restricting a healthy range of motion. Correct improper muscle function by providing neurosensory feedback during movement. Relieve pain from both acute injuries and chronic pain conditions. Reduce swelling and inflammation through enhanced lymphatic drainage. Accelerate healing via improved blood flow to injured tissues. Prevent overuse and overcontraction of working muscles. Accelerate recovery from intense exercise. Reestablish normal muscle activation following an injury. Increase muscle tone in injured or neurologically inhibited muscles.